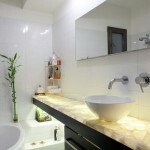 Bathroom accessories not only enhance the décor of the bathroom, they make the bathroom more functional. Accessories such as towel bars, robe hooks, and safety grab bars are easily installed and bring style to the confined space of the bathroom. Other accessories include towel racks and rings (which make folded towels easily reachable), shower-curtain rods, and glass and toothbrush holders. These accessories can be installed at home with basic tools, saving on the cost of renovation. To install surface mounted accessories, use an electronic stud finder to find studs in the wall. Drive the screws required for the accessories directly into the studs. If the electronic stud finder does not find any, use anchors. To install plastic or metal drywall anchors, drive into the drywall as you would a screw. Locate the center point, mark it, and place the center of the anchor over it. Drive the anchor flange to the surface, and install the screw into the anchor. For hollow-wall anchors, drill a hole as opposed to driving through the wall for better installation. Make sure the hole is the right size for the anchor. After inserting the anchor, drive in the screw to expand the wings. Take out the screw and install the bracket. Follow a similar process to install toggle bolts. For toggle bolts, however, the screw cannot be removed after the anchor is installed. Begin by taking out the toggle nut from the screw before inserting the screw into the hole. Then, carefully thread the toggle nut far enough so it is back on the screw. Finally, drill the sized hole in the wall and push the toggle nut through the hole. 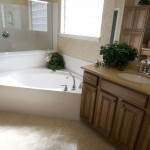 How can you increase space in a bathroom without any kind of major renovation? Try installing recessed accessories. Recessed accessories such as soap dishes and toilet-paper holders help give the illusion of more space in a bathroom, because they do not protrude far from the wall. Decide on the location of the accessory. Make sure the accessory does not hinder a door or cabinet, so make sure to test out the location while using the actual accessory. After that, mark a level outline in the wall. Score the drywall along the outline with a utility knife. Make sure the hole is big enough for the accessory (trim if necessary). Some accessories come with a retaining clamp that can be connected to the fixture and fits into the wall hole, although this may need to be purchased separately. After this step is complete, push the fixture into the hole to ensure the clamp snaps into the opening which is behind the drywall. Tighten screws, and enjoy your new accessory. Ideally you would want to install tile bath accessories when you tile your bathroom, although it is certainly possible to add tiles to pre-existing walls. To do so, however, you must remove some tiles. To start, measure the wall tiles in your bathroom, and make sure you know the colour and style of your tiles to ensure the addition will fit in with the rest of the tiles. After this, it’s time to remove the affected tiles. Break them out with a hammer and chisel. You should start in the center of the tile, and it is very important to ensure no damage occurs to the adjoining tiles, as you may end up replacing more tiles than you originally planned on. When hammering tiles, it is possible for debris to fly towards your face, so you may want to wear protective goggles. Make sure the accessories fit in the new openings, and then spread the tile adhesive in the opening. Place the accessory into the opening and press down before securing it with masking tape. Allow the adhesive to dry, remove the tape, and grout between the original tiles and new accessory to ensure a seamless transition.